헤이마켓 사건(Haymarket affair) 또는 헤이마켓 폭동(Haymarket riot)은 1886년 5월 4일, 미국 일리노이주 시카고 시의 헤이마켓 광장에서 진행되던 노동시위 와중에 벌어진 폭탄투척 사건과 그 결과 일어난 폭력사태이다. 애당초 시위는 그 전날 경찰에게 살해당한 노동자들을 추모하고 8시간 노동제를 요구하는 파업 참여 노동자들의 지지를 받는 평화 행진으로 시작되었다. 그런데 경찰이 그들을 해산시키려 하자 신원불명의 누군가 다이너마이트를 경찰 쪽으로 던졌다. 폭탄 폭발과 뒤이은 발포로 인하여 경찰 일곱 명과 민간인 네 명 이상이 죽었고, 숱한 사람이 부상을 입었다. 이후 무정부주의자 여덟 명이 음모 혐의로 체포되었다. 기소 증거는 피고 중 한 명이 폭탄을 만들었을 수 있다는 것 뿐이었고, 실제 그들 여덟 명 중 아무도 폭탄을 던지지 않았다. 피고 중 일곱 명에게는 사형이, 나머지 한 명에게는 징역 15년이 선고되었다. 사형수 중 두 명은 일리노이 주지사 리처드 오글스비가 종신형으로 감형해 주었고, 한 명은 교수대로 끌려가기 전에 자살했다. 나머지 네 명은 1887년 11월 11일 교수형에 처해졌다. 1893년 신임 일리노이 주지사 존 피터 올트겔드는 그때까지 살아있던 피고들을 모두 사면하고 재판을 비난했다. 헤이마켓의 순교자중의 한명인 아나키스트 어거스트 스파이스(August Spies)는 그의 재판에서 다음과 같이 언급하기도 했다. 헤이마켓 사건은 국제노동절의 유래가 된 중요 사건으로 생각된다. 사건 발생 장소는 1992년 시카고 시장이 결정하는 사적지(Landmark)로 지정되었고, 2004년 그 자리에 조각상이 설치되었다. 또한 억울하게 사형당한 이들의 무덤에 헤이마켓 순교자 기념물이 세워졌고 1997년 역사기념물로 지정되었다. ↑ “Originally at the corner of Des Plaines and Randolph”. Cityofchicago.org. 2009년 5월 6일에 원본 문서에서 보존된 문서. 2012년 3월 18일에 확인함. ↑ Smith, Carl. “Act III: Toils of the Law”. 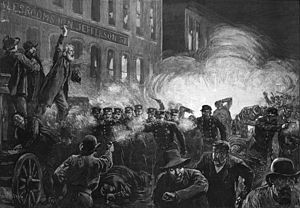 《The Dramas of Haymarket》. Chicago Historical Society and Northwestern University. 2012년 6월 4일에 원본 문서에서 보존된 문서. 2012년 6월 14일에 확인함. ↑ See generally, Gilmer, Harry L. (1886년 7월 28일). “Testimony of Harry L. Gilmer, Illinois vs. August Spies et al.”. 《Haymarket Affair Digital Collection》. Chicago Historical Society. 2008년 1월 15일에 원본 문서에서 보존된 문서. 2008년 1월 19일에 확인함. ↑ See generally, Thompson, Malvern M. (1886년 7월 27일). “Testimony of Malvern M. Thompson, Illinois vs. August Spies et al.”. 《Haymarket Affair Digital Collection》. Chicago Historical Society. 2008년 1월 15일에 원본 문서에서 보존된 문서. 2008년 1월 19일에 확인함. ↑ [I]f you think that by hanging us you can stamp out the labor movement — the movement from which the downtrodden millions, the millions who toil and live in want and misery, the wage slaves, expect salvation — if this is your opinion, then hang us! Here you will tread upon a spark, but here, and there and behind you, and in front of you, and everywhere the flames will blaze up. It is a subterranean fire. You cannot put it out. The ground is on fire upon which you stand. ↑ Trachtenberg, Alexander (March 2002) . 《The History of May Day》. Marxists.org. 2008년 1월 19일에 확인함. ↑ “Site of the Haymarket Tragedy”. City of Chicago Department of Planning and Development, Landmarks Division. 2003. 2006년 7월 14일에 원본 문서에서 보존된 문서. 2008년 1월 19일에 확인함. ↑ “Lists of National Historic Landmarks”. 《National Historic Landmarks Program》. National Park Service. March 2004. 2008년 7월 9일에 보존된 문서. 2008년 1월 19일에 확인함. ↑ “The Haymarket Affair”. illinoislaborhistory.org. 2014년 3월 18일에 원본 문서에서 보존된 문서. 2014년 3월 19일에 확인함. 이 문서는 2018년 11월 11일 (일) 21:54에 마지막으로 편집되었습니다.